(Open word flashcards-Composting) Print and laminate the word flashcards in the format you prefer. Use them to spark a conversation with your group during circle time. Ask children questions about the environment. 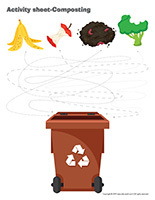 Do you know what composting is? 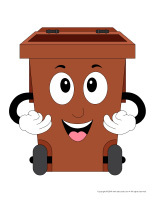 Do you know anyone who owns a compost bin? Did you know that there are many different types of gardens (vegetable garden, fruit garden, flower garden, farm fields, etc.)? 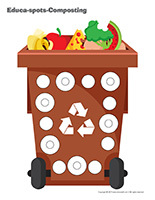 Using a picture for reference, name different items that can be composted with your group. What do we do with compost once it is ready? 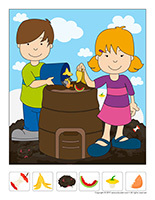 Gather a variety of tools that are used for composting and let children manipulate them. 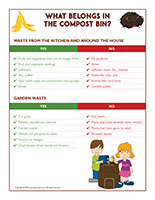 (Open thematic poster-Composting) Print, laminate, and display for parents to see. Hang a variety of vegetables, tissues, napkins, toys, and containers from the ceiling in your daycare. During circle time, identify compostable items with the children in your group. 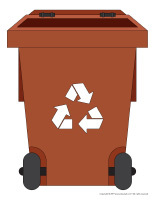 (Open posters-recycling-garbage-compost) Print and laminate the posters. Display them over the appropriate bins to help children identify which items belong in each one. 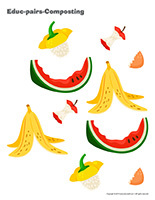 (Open stickers-Composting) Print the illustrations on adhesive paper and use them to create original stickers. 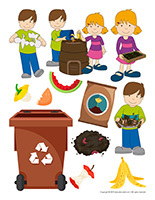 (Open educa-theme-Composting) Print, cut out, and laminate. Use the items to decorate the walls of your daycare to set the mood for the theme. 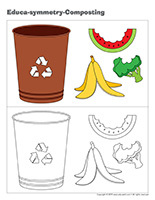 (Open educa-decorate-Composting) Print, laminate, and cut out. Use the items to decorate the walls of your daycare. (Open pennants-Composting) Print and cut out. Let children use the pennants to create a special composting-themed garland you can hang within your daycare or near your daycare entrance. Hang different types of bags (grocery bags, plastic bags, compost bags, recycled bags, etc.) from the ceiling in your daycare. During circle time, determine which bags are compostable with your group. The pictures may be used as a memory game or to spark a conversation with the group. Use them to decorate the daycare or a specific thematic corner. 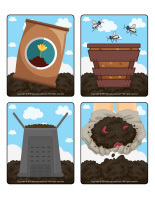 (Open picture game-Composting) Print, laminate, and store in a “Ziploc” bag or in your thematic bins. 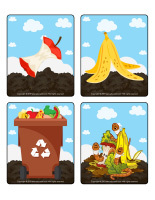 (Open picture game-Composting) Print two copies and use the cards for a memory game. 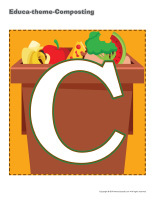 (Open writing activities-C like composting) Print for each child or laminate for use with a dry-erase marker. 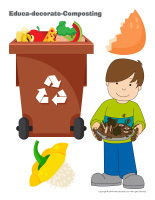 (Open educa-spots-Composting) Print for each child. Use bingo markers to add a touch of color inside each circle. If you don’t have bingo markers, simply ask children to set Cheerios or press a sticker inside each circle. (Open word flashcards-Composting) (Open giant word flashcards-Composting) Print and laminate the word flashcards. Have each child pick a word and present it to the group (ex. fertilizer). Ask them questions to see what they know about the theme. 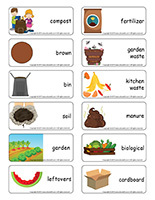 (Open giant word flashcards-Composting) Print, laminate, and display the word flashcards on a wall within your circle time area or on a large piece of cardboard that can be moved around. Print a second copy of each word flashcard and cut each card from this series in half so that you have one series with words and one series with the corresponding illustrations. Press Velcro behind each card. Stick a piece of Velcro next to each complete word flashcard on your board and invite children to match the words and illustrations and stick them on your board. (Open scene-My neighbourhood) Print and laminate the scene and the smaller items. Invite children to use them to decorate the scene. Set several different types of fruits and vegetables in a bin and let babies manipulate them. They will have fun rolling them, transporting them, etc. Collect several vegetable pictures and illustrations. Use them to create a picture book that babies can manipulate during transition periods. Stick several pictures of fruits and vegetables on the floor to create a path. Invite children to crawl from one picture to the next. Name the fruits and vegetables as they reach them. (Open lacing-Composting) Print, laminate, and punch holes all the way around the contour of each model. Children can thread a string, a shoelace, or ribbon through the holes. Use brown paper grocery bags to create a path. Simply set them on the floor and invite children to hop from one bag to the next. At the end of the path, encourage them to toss a brown paper bag in the air and try to catch it before it falls to the ground. If they don’t succeed, they must go back and complete the entire course again. Have children pretend they are a small seed in the ground (curl up in a ball). Announce that it’s starting to rain (they move gently while remaining curled up in a ball). The seed shoots out of the ground (children raise their head and upper body). The sun is shining, helping the seed grow (very slowly, children stand up tall). The seed becomes a beautiful flower (children stretch out their arms and pick an original pose). The wind begins to blow (children sway side to side, keeping their feet firmly on the ground). Invite children to sit in a circle on the floor. They can take turns saying, “In my compost bin, there are (ex. radishes).” Each child must repeat the items previously mentioned before adding one of his own. Have one child curl up in a ball, placing his hands under his thighs to represent a bag of potatoes. Two or three children pull him by the legs to a predetermined spot, where bags of potatoes are stored. Children will all want a turn at being the bag of potatoes. Provide a variety of different types of containers. Cardboard boxes are perfect for this activity. Children will love using the recycled materials to represent compost bins. Your local grocer will be happy to provide boxes. Let children use their imagination! 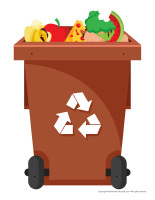 As you walk around your neighborhood with your group, have fun counting the compost bins you see. Set up a gardening area in your yard. Provide toy wheelbarrows and lawn mowers, gardening tools, compost containers, fabric flowers, gardening gloves, etc. If you wish, you may also fill a kiddie pool with soil and plastic vegetables to represent a large compost bin. Set up a small garden in one corner of your yard. Plant a variety of vegetables. Children will have fun caring for the plants and observing them as they grow. Use balance beams, tunnels, hula hoops, etc. to create an obstacle course. Stick pictures of vegetables along the course. Have children complete it, holding a bag of compost in their hands. They can set the vegetable pictures on it if they wish. Use wooden clothespins to hang a variety of paper vegetables from the branches of the trees in your yard and invite children to “pick” them. Set a variety of objects in a paper bag or cardboard box. Select items that children are familiar with that come in different sizes and offer a wide range of textures. Ask them to close their eyes or blindfold them. Give a child an object and encourage him to manipulate it to guess what it is. As a group, determine whether each object is compostable or not. (Open game-I recycle, discard, compost) Print the posters and cards. Laminate them for durable, eco-friendly use. Display the posters on a wall. 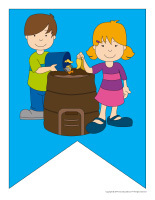 Children take turns picking a card and associating it with the correct bin (recycling, garbage, compost). (Open educ-pairs-Composting) Print. Children must color identical illustrations using the same color or draw a line between both items. For durable, eco-friendly use, laminate the sheet for use with dry-erase markers. (Open educ-trace-Composting) Print for each child. Children must trace the lines with the correct colors and then color the corresponding items using the same colors. (Open educa-symmetry-Composting) Print. Children must color the bottom picture (black and white) to make it look exactly like the top one (color). (Open educ-intruder-Composting) Print and laminate. Children must identify the six (6) intruders. Sit in a circle with your group. To the sound of music, children pass a plastic vegetable around the circle. When the music stops, the child who is holding the vegetable sets in behind him. The music starts playing again and children pass a different vegetable around the circle. At the end of the activity, count how many vegetables each child collected. Set brown paper grocery bags on the floor. You must have one bag less than the number of children in your group (for six children, you will need five bags). To the sound of music, children walk or dance around the bags. When the music stops, children must sit on a brown paper bag (as in musical chairs). Create a compost corner within your daycare. Fill a container with soil and add a few gardening tools, plastic vegetables, an empty watering can (to avoid spills), etc. Children will have fun manipulating their compost and adding vegetables. Give each child a paper plate. Have them moisten a few cotton balls and set them on their plate. The bottom of their plate should be completely covered with cotton balls. Sprinkle alfalfa seeds on the cotton balls and set the plates next to a sunny window. The next day (or 48 hours later), sprouts will appear. Children will enjoy tasting them. Purchase a large bin. Punch holes out of the bottom of your bin and spread 1 to 2 inches of rocks on the bottom of the bin before filling it with soil. With the children in your group, plant a variety of vegetables (beans, carrots, and radishes are easy to grow). Use your gardening bin to teach children all about gardening. Pick the vegetables when they are ready and enjoy them at lunch time or as a snack. Fill a large bin with soil and plant a few vegetables that still have their leaves attached so that your bin looks like an actual garden. Provide gardening tools and set a compost bin nearby. You can keep different types of seeds. Show children how they can remove the seed from different fruits and vegetables such as melons, pumpkins, peas, apples, tomatoes, avocados, etc. Encourage children to wash them to remove any pulp. Set the seeds out to dry. Once they are completely dry, add them to airtight glass jars or plastic containers. Do not forget to label the containers with the type of seed and date. Children can plant the seeds they collected in the garden. (Open puppets-Composting) Print the various models on cardboard. Ask children to cut them out and decorate them with arts & crafts materials. Glue a Popsicle stick behind each one to complete the puppets. 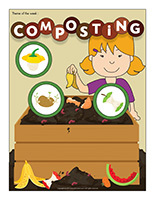 (Open models-Composting) Print the various models and use them for your crafts and activities throughout the theme. (Open craft-Mrs. Earth) Print. Have children color and cut out the pieces. The planet will represent the body and head. Fold strips of paper accordion-style to represent the character’s arms and legs. Glue the medium-sized flowers on the end of each strip of paper to represent hands and feet. Trace or print a vegetable outline on paper and have children fill the shape with crumpled pieces of tissue paper. Create a special tablecloth that can be used for a picnic. Press cut vegetables in paint and use them to make prints on the tablecloth. If, for example, you cut the base off a celery, it will look like a rose. An apple’s core will look like a star. Trace vegetable shapes on large pieces of cardboard (two of each). Staple the contour of identical shapes together, leaving an opening at the top. Have children fill the shapes with newspaper. When they are done, staple the opening. Let children paint the giant vegetables. Set a large white paper banner on a table. Hand children ears of corn and encourage them to roll them in paint and then on the paper. Visit your local grocery store and ask for vegetables that are past their prime. You can use them for a painting activity with your group. An asparagus, for example, makes a great paintbrush whereas the tip of a carrot can be used much like a pencil. 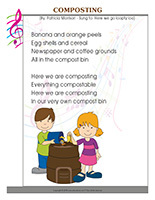 (Open coloring pages theme-Composting) Print for each child. 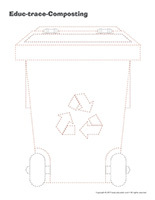 (Open complete the drawing-Composting) Print for each child. Invite children to draw the missing parts to complete the picture.